A heavenly after dinner liqueur that is wonderful for sipping or making mixed drinks. Thoroughly wash lemons to remove wax and pesticides if not using organic. With a vegetable peeler, peel lemons removing just the zest and leaving the white pith. Try to remove any remaining pith on zest with a small pairing knife as it will make the liqueur bitter. Empty a small amount of vodka into a separate glass to make room for peels. Gently insert the zest from 8-10 lemons in each jar. Seel the bottles and store in a cool dark place for 75-80 days. Once the 80 days has past, strain vodka through a fine mesh colander into a large pitcher. This will separate the vodka from the zest. In a lg sauce pan bring to a low simmer sugar and water until sugar in completely dissolved. Add to vodka and stir well. Let cool to room temperature. 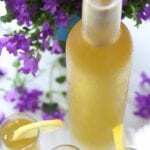 Wash and sanitize canning jars or limoncello bottles. Once jars are washed and dried pour limoncello into them using a funnel to prevent spilling. Store in refrigerator for quick use or freezer for longer storage.